In addition to using high quality algorithms, essentialFX features clearly laid out individual parameters and efficient operation. The suite's uniform controls, combined with low resource consumption and high-quality output, make it the perfect studio tool. A flexible gate with optional soft knee characteristics and sidechain filter function for ducking effects. An optimized channel strip with compressor, deEsser, gate, highpass filter and tone shaping for recordings containing vocals or speech. A classic compressor with soft clip function and advanced sidechain filter feature. A tremolo effect with optional tempo sync function and parameters for rate, shape, tremolo and panorama. A traditional chorus/flanger effect with adjustable rate, depth, feedback and mix settings. A dynamic plug-in for reducing unwanted sibilants in speech and vocal recordings. A classic phaser effect with adjustable rate, depth, feedback and mix settings. An authentic analog tube amplifier simulation with an oversampling mode. An efficient dynamic tool for increasing the loudness of the audio signal and preventing clipping. Reverb plug-in for creating versatile reverb effects - from short to long reverberations. Stereo delay with individually adjustable delays for both channels, as well as a tempo sync feature. The new essentialFX Suite is a collection of 11 first-class effect plug-ins and is suited for all every day studio applications. In addition to high-quality algorithms, great importance was placed on practical icons for the individual parameters and the effectiveness of the function. The uniform operation concept, combined with low resources demands for top quality production, makes the essentialFX suite a collection of high-quality audio tools for all-around tasks. 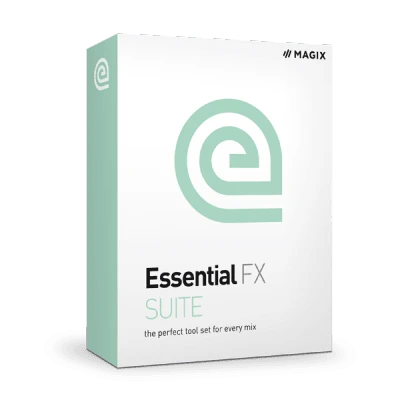 essentialFX Suite is available as a VST plug-in.